The money will be used for the 2020 festival, allowing eight new pieces of work to be developed. Glasgow's Celtic Connections festival has been awarded £100,000 of Scottish Government cash, after winning funding from the Expo Fund for a second consecutive year. Culture secretary Fiona Hyslop announced the financial boost as this year's event, which spotlights traditional, world and folk music, drew to a close. The Expo Fund cash will be used to further develop the 2020 festival, allowing for eight new pieces of work by Scottish composers to be developed. These will then be brought together into a single symphonic piece by composer Greg Lawson, which will be performed by the Grit Orchestra. Since 2008 the Expo Fund has invested £21m in Scotland's major festivals, boosting arts and culture. Ms Hyslop said: "Celtic Connections presented an excellent application for next year's festival, which will build on the huge success of previous years, therefore I'm pleased we can continue our support. 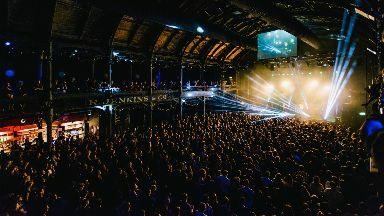 "Over the past 26 years, Celtic Connections has gone from strength to strength, developing a vibrant programme that lights up Glasgow's dark winter months and attracts festival goers and talent from around the world. "It is now one of the world's largest winter music festivals and boosts Scotland's culture, tourism and economy. "Celtic Connections is an excellent example of the international reach our festivals offer, enhancing Scotland's reputation as welcoming and inclusive, which is so important as we strengthen relations with our European friends during these turbulent times." Donald Shaw, artistic director at Celtic Connections, welcomed confirmation of the cash boost, saying: "We are delighted that the Scottish Government Expo Fund has been opened up to us again, for Celtic Connections 2020."